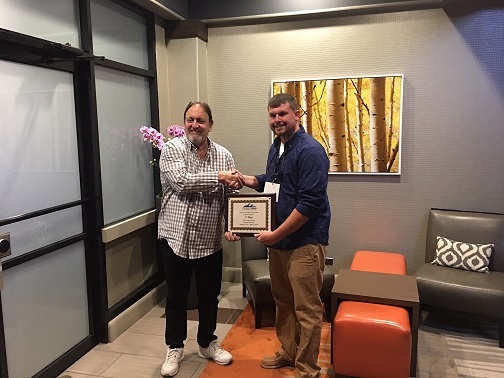 Hopkinsville Solid Waste Enterprise General Manager Tony Sicari proudly announced that team member Jason Smith outmaneuvered 57 other drivers to be named the best Automated Side-Loader operator in the nation at the International Truck Road-E-O in Denver, Colorado last month. The Road-E-O was held as part of the annual meeting for the Solid Waste Association of North America (SWANA). This year marks the first time a local utility professional has ever been recognized for this national distinction. Smith is a three and a half-year veteran at Hopkinsville Solid Waste where he serves as a Route Specialist and is trained to drive every piece of equipment used by the organization. Sicari remarked, “I couldn’t be more proud of the Hopkinsville Solid Waste team who placed at the state level and represented us so well nationally. We are especially excited for Jason who demonstrated the level of professionalism and skill we have among local staff. Serving over 8,000 members throughout North America, SWANA has been the leading professional association in the solid waste field for more than 50 years. SWANA has made its mission to advance the practice of environmentally and economically sound management of municipal solid waste in North America. SWANA is composed of chapters in each of the fifty states, with Hopkinsville Solid Waste belonging to the Western Kentucky Chapter. Sicari has also served as one of eight members on the chapter’s board of directors since January 2012. For more information on the award, please contact Tony Sicari at (270) 887-6245.